If a middle school student and a high school student collaborate on an entry, it will be classified as a high school submission. Competition registration. See details in Next Steps (below). Registration for the competition provides the committee with a rough estimate of the number of entries that will need to be judged. Entries must be an ArcGIS Online web app or story map. Entries must be aligned with the competition theme and focus on the physical and/or social environment within today’s borders of the Commonwealth of Virginia. The “How has my environment (physical or social) changed over time?” theme is broad enough to encompass a variety of disciplines and multiple perspectives encompassed by the anchoring geographic area of Virginia. Students could research and explore a variety of topic within the context of change in the physical and social environments. Environmental issues facing Virginia and/or the local community; costs and benefits of modification of the environment; effects of natural disasters; invasive species; ecosystems through time; historical events and movements; efforts of individuals and groups to bring about social and environmental change; changes in demographic characteristics; population distribution; economic activities; the cultural landscape and more. Student-created products must focus on environments and events located within the Commonwealth of Virginia. An award of $100 to the top five middle school teams and the top five high school teams. The winning teams will be notified by Friday, May 22, 2018. Only one team from each division will be submitted to the national competition. 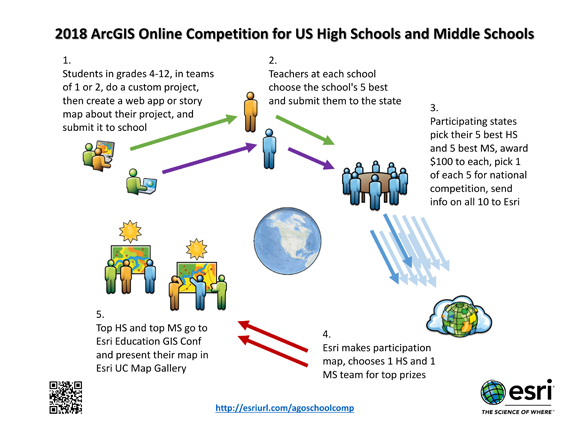 Esri will provide a travel grant to one high school team and one middle school team, each team consisting of the student(s) and at least one parent/guardian (could be teacher/rep). Awardee teams must agree to attend the Esri Education GIS Conference (“EdUC”), arriving by 10am PT Sat July 7, and staying through at least 4pm PT Tue July 10, 2018. Awardees will be responsible for handling any tax implications, be personally identified including name and photograph, and post a graphic in the Esri User Conference (“UC”) Map Gallery on Monday. Awardees will be recognized at EdUC on Sat and UC Map Gallery on Monday, and likely have additional attention. Entries must be visible without requiring a login. Entries using “premium data” (log-in required such as the Living Atlas ) must set up the display to permit access without needing a log in. See procedures here. Entries must be “original work by students,” but may use data generated by outside persons or institutions with guidelines of “fair use.” Students are encouraged to use appropriate professionally generated data, but the integration, treatment, and presentation must be original. Entries must provide two links in “short URL” format (e.g., http://arcg.is/1KfRSSR). Users can create a short URL in “ arcg.is” format at http://bitly.com. Esri has a relationship with bitly so that any URL string formatted as “anything arcgis.com” will be turned into a short URL formatted as “arcg.is”anything. Virginia will use a rubric that includes the criteria and weighting of the national rubric that follows. The product includes more than uniform dots/lines/areasThe product includes more than pictures. For the state competition each school will submit the entry using only the first name and last initial of the students. Judges will see only the finished product without identifying student information. The information will be kept confidential by the state competition committee administrators. The winners of the state competition will be notified and provide authorization to disclose the information as stated below..
States must help potential entrants understand the level of PII required. Entries submitted to Esri for the top national prize (i.e. 1-HS and 1-MS) must agree in advance to expose student names, school names, and school city/state (home school students would be identified to closest city/town name). Registration is requested so that the VGA can determine the number of entries anticipated. Submission of registration form does not obligate your school’s participation. Absence of registration does not preclude your school from entering the competition. Registration forms are due by midnight December 14, 2017. Should you have questions or need further information send email to vgamapstory@gmail.com. Expect to receive response within two business days. New to the competition this year is an opportunity for early mentoring. This process provides an opportunity for the judges to provide feedback and advice on the product’s content and presentation. The judges will not score the entry during this initial review. Feedback will be provided to the teacher. Students can then choose whether or not to modify their projects based on the judge’s recommendations. The feedback will be sent to the teacher. The form for submitting entries for early mentoring must be submitted by Thursday, March 8, 2018 and feedback will be provided to the requesting teacher by March 23, 2018. Webinars will be conducted via WebEx in early evening hours. Teachers who pre-registered their schools will receive notification when the dates are set via email. Social media will be used to advertise the event to the greater GIS community. Email questions and suggestions to vgamapstory@gmail.com.